The music on this recording marks a special reunion, a rare live duo performance of living legends David “Dawg” Grisman and Tony “T” Rice. The program includes tunes from their groundbreaking CD Tone Poems with bluegrass and jazz classics and other dawg originals. 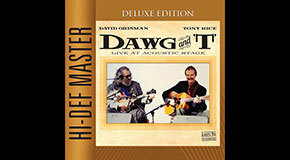 This might be the only duet recording of “Dawg’s Rag”, “Fanny Hill” or Tony’s “Devlin’”. These giants of acoustic music are in top form here and the recording is so good it’s just like listening to them backstage with “Dawg” in one ear and “T” in the other. Now that folks, is what your ears are made for — perfect stereo!